The 3 people killed in a wrong-way crash on an I-95 exit ramp have been identified. 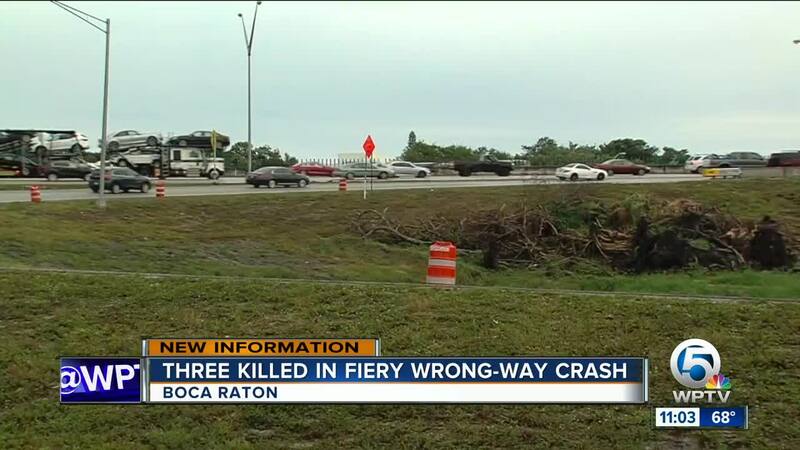 BOCA RATON, Fla. -- Three people died in a wrong-way crash on I-95 in Boca Raton early Saturday. Florida Highway Patrol (FHP) says a 2012 Kia Optima with 35-year-old Christopher M. Alfeo of Boynton Beach (driver) and 25-year-old Amber C. Reif of the United Kingdom (passenger) was traveling the wrong direction on the I-95 southbound exit ramp for Palmetto Park Road at 12:55 a.m.
Alfeo's Kia crashed into the front of a 2018 Hyundai Sonata driven by 57-year-old Brenda E. Walker of Fort Lauderdale on the exit ramp. FHP says the Hyundai caught fire after the impact and became engulfed with flames. All three individuals were pronounced dead at the scene of the crash. The cause of the crash remains under investigation.